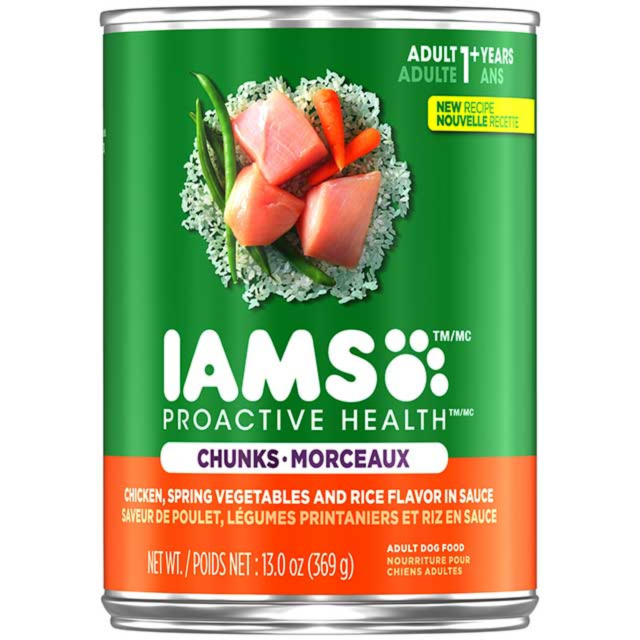 Give your dog the taste of a home-cooked meal with IAMS PROACTIVE HEALTH Adult Wet Dog Food. Our wholesome dog foods are made with natural ingredients, such as chicken, vegetables and rice in a savory broth for a taste dogs can't resist. 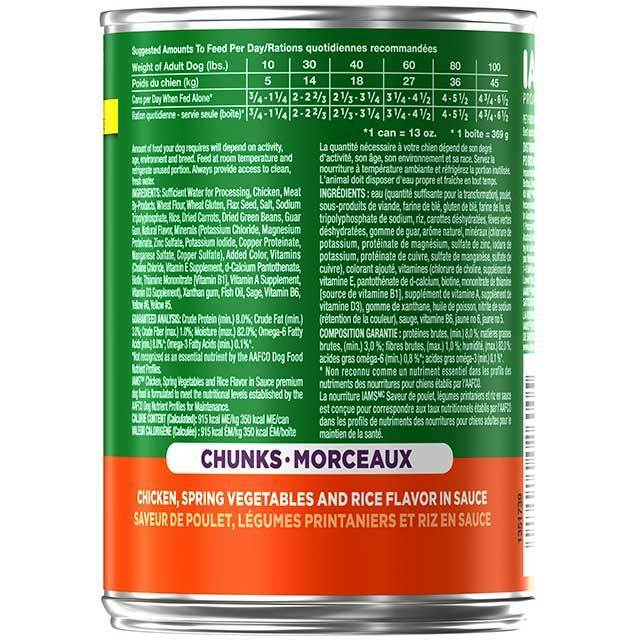 SUFFICIENT WATER FOR PROCESSING, CHICKEN, MEAT BY-PRODUCTS, WHEAT FLOUR, WHEAT GLUTEN, FLAX SEED, SALT, SODIUM TRIPOLYPHOSPHATE, RICE, DRIED CARROTS, DRIED GREEN BEANS, GUAR GUM, NATURAL FLAVOR, MINERALS (POTASSIUM CHLORIDE, MAGNESIUM PROTEINATE, ZINC SULFATE, POTASSIUM IODIDE, COPPER PROTEINATE, MANGANESE SULFATE, COPPER SULFATE), ADDED COLOR, VITAMINS (CHOLINE CHLORIDE, VITAMIN E SUPPLEMENT, d-CALCIUM PANTOTHENATE, BIOTIN, THIAMINE MONONITRATE [VITAMIN B1], VITAMIN A SUPPLEMENT, VITAMIN D3 SUPPLEMENT), XANTHAN GUM, FISH OIL, SAGE, VITAMIN B6, YELLOW #6, YELLOW #5.